Pre-Order now for Q1 2018 reprint! 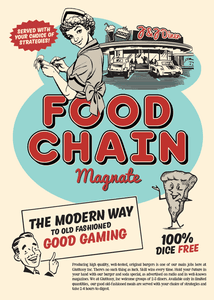 Splotter Spellen, makers of Food Chain Magnate, Antiquity and many other beloved Euro-Style games, to have a new reprinting of one of their most popular games, Food Chain Magnate available in Q1 of 2018! Food Chain Magnate is ranked #26 on BoardGameGeek for all board games, and it is ranked #15 for all games in the strategy category. It is a superb resource management game that continues to grow with more and more attention being brought to it, almost on a daily basis!
. We will be accepting pre-orders beginning today to go along with several back orders we have in place already. We're looking forward to another successful sell out of this great game, that continues to be a staple in the euro-style genre.